In just 3 weeks, the highly anticipated Pharmaceutical Microbiology East Coast conference and exhibition will take place in Boston, USA, on April 10 & 11, 2019. BOSTON, MA, UNITED STATES , March 20, 2019 /EINPresswire.com/ -- SMi Group are delighted to share 10 key reasons to why you should attend the this event in Boston, next month. This year’s agenda features a series of presentations from industry experts to discuss the key topics in the pharmaceutical microbiology industry such as risk management and preparing risk-based programs. Attendees will also learn about key trends and answer questions around environmental monitoring and critical utility. A highlight of the 2019 event will be to explore the latest in regulatory changes and evaluating strategies to ensure compliance e.g. revision of the Annex 1, disinfectant validation and methods, endotoxin detection methods and microbiological methods. "I currently hold the position of Chairman for the Pharmaceutical and Healthcare Sciences Society (PHSS) and lead the PHSS Annex 1 focus group from which 100 pages of comments were provided to the EMA during the revision consultation process. Also as part of the UK delegation from UCL: University College London, to provide Jordanian and Saudi Arabia FDA inspectors training on Quality assurance sterile product manufacturing including environmental control and monitoring for aseptic processing, I am aware of current challenges and knowledge gaps for both the industry in regulators. I believe that SMi’s Pharmaceutical Microbiology series highlights key areas of industry changes, and provides a useful platform for networking, idea and knowledge sharing, and collaboration." There are also two focused pre-conference workshops that will take place on Friday April 12th, 2019 at the same venue, The Battery Wharf Hotel. 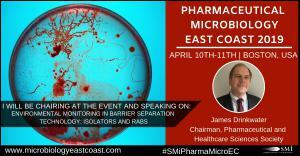 The Pharmaceutical Microbiology East Coast event will also feature an exhibition space where several organisations will showcase their latest products and services including: Associates of Cape Cod, bioMérieux, Bioscience International, BioVigilant, Charles River, DuPont, Innovaprep, Mettler Toledo, Novatek and University of Guelph - Laboratory Services Division. Those attending the conference in April will also have the chance to network with 100+ professionals from the microbiology industry.